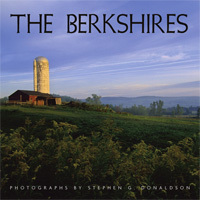 With 40 new photographs added, the Revised 2nd Edition of "The Berkshires" has been expanded from 128 pages to 144. This book now contains 187 photographs of the landscape, the towns and villages, and the people and places of Berkshire County, in western Massachusetts. 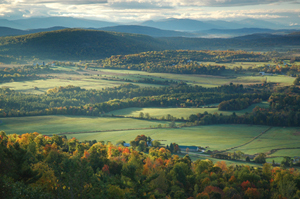 The Berkshire Eagle reported, "Scenes of vast beauty, often ignored by residents who pass by them daily, are laid out in perfect display through his lens. The county seems flawless on the pages of the book, without heavy summer traffic or encroaching developers." The Second Edition was printed in Pittsfield, MA by Quality Printing Company, an environmentally-friendly company using solar power and soy-based inks. Publisher: Stephen G. Donaldson photography, inc.
To purchase a signed and personalized copy, click on the link below and specify the quantity and the inscription you would like. Barns of The Berkshires has been released. 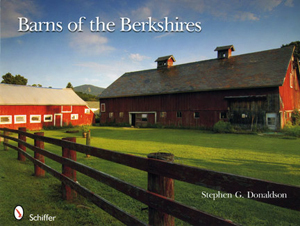 This 110-page book features 123 color photographs, and more than 15 pages of accompanying text, tracing the history of barns and barn building in the Berkshires, as well as a discussion of the development of building techniques and styles over the last 250 years. This is the first book of its kind to concentrate exclusively on barns in this iconic corner of the United States. This ground-breaking large format photography book contains 330 images that lead the viewer on a visual journey along Route 7, from the Connecticut shore of Long Island Sound to the Canadian border in Vermont. It captures the iconic landscape, small town life and rich cultural heritage of one of America's original interstate byways. The extensive accompanying text reveals the history of the road itself and the villages, towns, and cities along its route. The entire book is a celebration of the rich history and stunning natural beauty of America's most storied roadways. All images on this site © Stephen G. Donaldson photography. All rights reserved. Photographs may not be reproduced or altered without photographer's consent.